The words "diligently carved" are the sort of thing that might be expected to be written at the end of a printed text indicating who was responsible for carving the woodblocks ("diligently carved by X"), but these are handwritten, appear to be written in isolation, and are not preceded by a personal name. But the big question is what are the two symbols underneath the words "diligently carved" on both fragments ? The two symbols, which are similar to each other but clearly distinct, are constructed with the same sort of brushstrokes that are used for writing Tangut or Chinese, but they do not seem to be Tangut, Chinese or Khitan characters, or indeed characters from any script that I am familiar with. The fact that the same two Tangut characters and following two symbols are written twice suggests that the author was practicing writing them; and given that he appears to be already able to write Tangut fluently, it is most probable that he was practicing writing the two symbols. But why would anyone need to diligently carve these two symbols ? My only guess is that they are some sort of magical symbols intended to be used as a talisman, and that perhaps the word "carve" is here used in an extended sense of "inscribe", meaning that the writer has diligently inscribed these magical symbols on the paper. 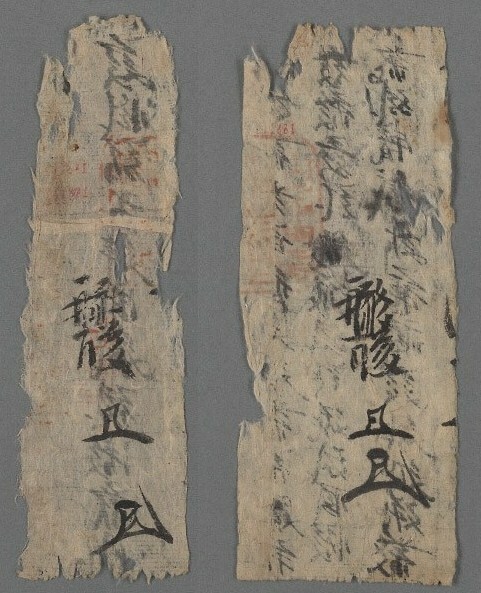 Maybe these two scraps of paper were deliberately torn off an old sutra, and the two symbols inscribed on them as a form of talisman. But that is just speculation — if anyone recognises these symbols or has any better suggestions as to what they mean, then please let me know. Терентьев-Катанский, А. П., Книжное дело в государстве тангутов (по материалам коллекции П. К. Козлова). Москва: Наука, 1981. 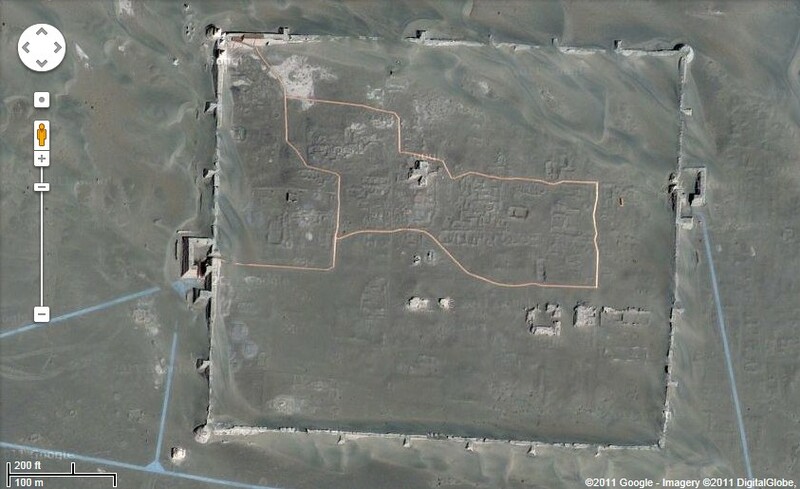 The remains of the Tangut fortress city known in Mongolian as Kharakhoto "Black City" and in Chinese as Heishuicheng 黑水城 "Black Water City" are located on the edge of the Gobi desert in the far west of Inner Mongolia (41° 45′ 51.50″N, 101° 08′ 38.00″E). It was a major military outpost of the Western Xia regime until it was captured by Genghis Khan in 1226. The city remained under Mongolian control until it was taken by the army of the newly established Ming dynasty in 1372, after which it was abandoned. 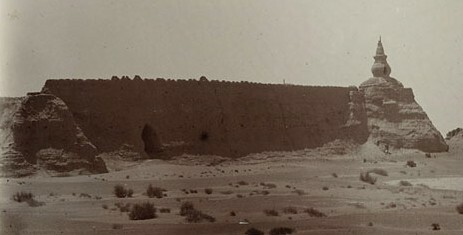 When the Russian explorer Pyotr Kozlov stumbled upon the ruins of the city in 1907–1909 he found hundreds of books and documents written in the Tangut script, mostly hidden inside a stupa, including such important works as the Tangut dictionary, the Sea of Characters (文海). But by the time that Aurel Stein came to visit Kharakhoto during his expedition of 1913-1916 there was not much left, and he was reduced to searching through rubbish tips and looking down wells. 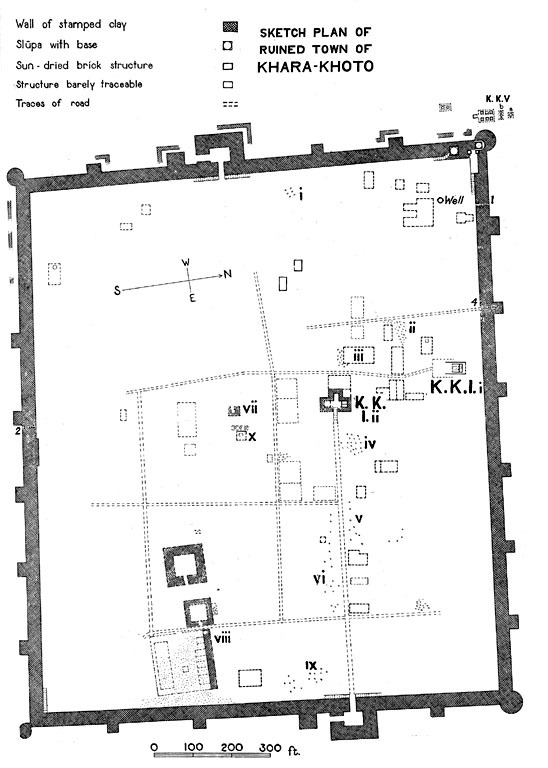 Although he didn't find any complete Tangut texts such as Kozlov had, he did manage to recover a great number of fragmentary scraps of paper with Tangut writing, some 4,000 of which are now held at the British Library (enter "Kharakhoto" in the search box to see some examples). 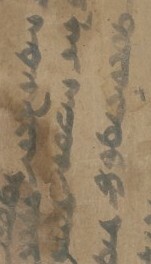 It is not very much, but it is the only certain example of the Phags-pa script that I have been able to find in the entire online collection of the International Dunhuang Project (there are other more impressive examples of Phags-pa manuscripts, and even a fragment of a printed text, in the Berlin Turfan Collection, but these are not yet in the IDP database). Incidentally, although there is such a paucity of Phags-pa material in the British Library's Dunhuang collection, the library does hold the only known copy of what I would argue is the single most important Phags-pa text in existence, the Phags-pa Chinese rhyming dictionary Měnggǔ Zìyùn 蒙古字韻 (Or. 6972). This would theoretically give 49 × 12 × 4 × 38 = 89,376 possibilties for the four-syllable phrase ti khung ·an tu, but actually there is only one permutation that makes any real sense in this context: tí kòng àn dú 提控案牘, which is the title of a minor official in charge of official documents at the local government office during the Yuan dynasty (see Charles O. Hucker, A Dictionary of Official Titles in Imperial China (Stanford University Press, 1985) #6453: "tʼí-kʼùng àn-tú 提控案牘 or tʼí-kʼùng YÜAN: lit., in charge of files: Record Keeper, a lowly or unranked clerical worker commonly found in both central government agencies and units of territorial administration"). The lettering appears to be printed on the paper rather than handwritten, so this was perhaps a stamp that was used by this official sometime during the Mongolian occupation of Kharakhoto between 1226 and 1372 (though of course it must post-date the invention of the Phags-pa script in 1269). Khitan Miscellanea 1: Oh, How the Gods Mock Us! On Boxing Day last year I wrote a blog post about the mystery of the two Khitan scripts in which I confidently asserted that "not a single manuscript or printed text in either Khitan script has survived". Ironically, less than a month earlier, on the 29th November 2010, my friend Viacheslav Zaytsev of the Institute of Oriental Manuscripts [IOM] in Saint Petersburg had announced his identification of a 100+ page manuscript codex as being written in the Khitan large script. This manuscript had been held at the IOM for many years, but as it was written in a cursive hand no-one had been able to identify the script with certainty. Most experts who had seen the manuscript had thought it was probably written in the Jurchen script, but by carefully comparing the text of the manuscript with memorial inscriptions written in Large Khitan, Viacheslav had been able to identify stretches of text that occured in both, and he was thereby able to prove for the first time that the manuscript was written in the Khitan large script. After finding out about Viacheslav's incredible discovery on 9 October, I made a correction to the offending blog post, confidently concluding that "this is the first and only manuscript written in either Large or Small Khitan to have been identified". 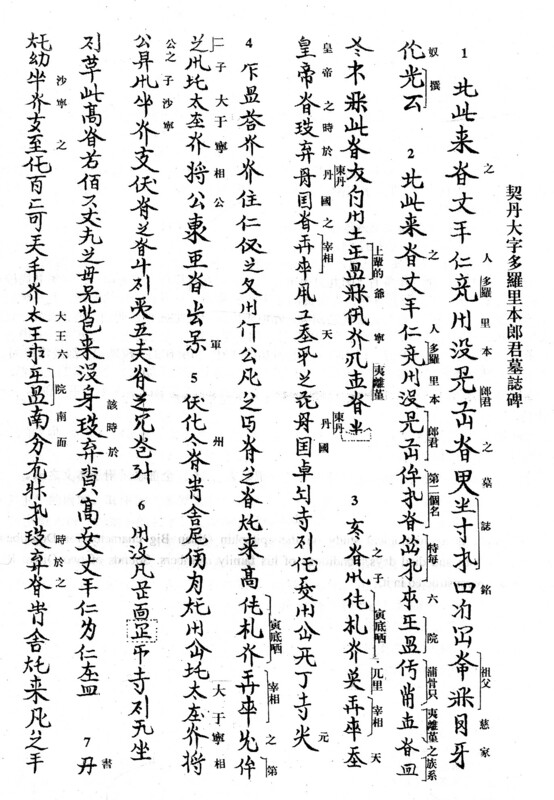 And then a couple of days ago, Viacheslav kindly pointed me to an article written by Wang Ding in 2004 in which he discussed his identification in 2002 of a fragment of a paper manuscript held at the Berlin-Brandenburg Academy of Sciences and Humanities as being written in the Khitan large script. Although I haven't got anything much to add to Wang Ding's research, it is such an exciting yet exasperating discovery that I feel that it needs to be publicized. This tiny fragment is not just a few random words scribbled on the back of a sutra, as is sometimes the case with Turfan and Dunhuang manuscript fragments, but from the neatly brushed calligraphy and neatly ruled guidelines it is clear that this is a fragment of a page from a carefully written text by a professional scribe that would probably have comprised at least several pages, maybe a whole book. Most significantly, to the right of each line of Khitan text are glosses in the Old Uyghur script, so if the whole text had survived it may well have acted as a Rosetta Stone, allowing for the decipherment of the as yet largely undeciphered Khitan large script. If only a single page of the text had survived then there would probably be enough to significantly improve our ability to read otherwise unreadable Khitan inscriptions. If only part of a page covering a few incomplete lines had survived then no doubt there would still be enough to enable us to learn the meaning or pronunciation of a few more Khitan characters. But this paltry fragment of tattered paper, the greater half of which is occupied by empty space, with just four complete and three partial Khitan characters clinging on to the runt side — what can it teach us of the lost Khitan language and its enigmatic script? Surely the Khitan gods are mocking us with this beautiful and tantalising fragment which hints at so much but tells us so little? 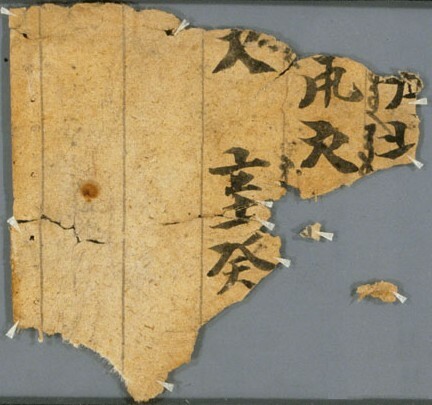 We do not even know where this particular fragment was found; it is just an odd piece of paper that was picked up during one of the German expeditions to Turfan between 1902 and 1914, and ended up in the Berlin collection, miscatalogued as a Chinese divination text until Wang Ding recognised it in 2002. But, to be brutally honest, the scholarly value of this one fragment is extremely limited, and unless there are other surviving fragments of this text (extremely unlikely) we may never understand what exactly is written on it. The table below is based on Wang Ding's research on the surviving text, with some notes and interpretations of my own. A.i This character is too incomplete to identify with certainty, but it may be or (two variants of the same character). This character occurs three times in the memorial for Yelü Ji 耶律褀 (1033–1108), each time immediately preceding the character . A.ii This is probably the left side of a character that is variously written or or . This character has been interpretted as meaning "north" (Chinese běi 北) in some inscriptions, but it has also been interpretted as a phonetic transcription for Chinese characters pronounced shàng (e.g. 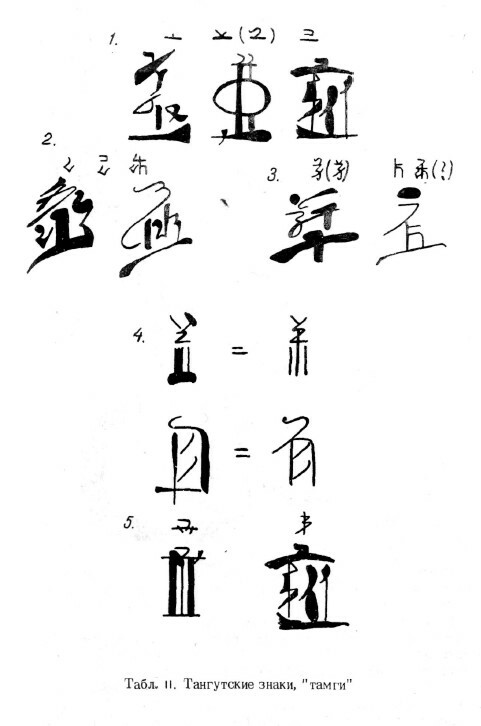 上 and 尚) in other inscriptions. It is quite similar to the character , but the two characters are clearly distinguished in, for example, the memorial for Lord Dorlipun 多羅里本郎君 (1037–1080) where the sequence occurs at the very start of the inscription. ᠊ᠤᠷᠤᠨ This character is probably the same as , which is an uncommon Khitan character of unknown meaning (there is also an uncommon Jurchen character of unknown meaning that looks like this). The Uyghur gloss -urun (or -orun) may represent either the end of a Uyghur word translating the meaning of the Khitan character or it may represent the pronunciation of the Khitan character. Wang Ding does not offer any suggestions for this gloss, but I wonder if this is not simply the common Uyghur word orun ᠣᠷᠤᠨ "place, seat, throne, territory, country". ᠬᠠᠴᠤ‍ The brush strokes of this character make it hard to clearly identify this character, but it is probably , which is an uncommon Khitan character of unknown meaning. Wang Ding suggests that the Uyghur gloss qaču- (alternative reading qaǰu- as č and ǰ are not distinguished in OU) may be a phonetic transcription of the Khitan word meaning "iron", which is phonetically glossed as hé zhú 曷朮 in the History of the Liao Dynasty. On the other hand, I would suggest that qaču- could represent the start of the Uyghur word qačuɣ, meaning the "sphere of perception or sense " in a Buddhist sense, translating the Sanskrit āyatana or viṣaya (see Hamilton 1986 p.65). This would make sense as the majority of Turfan and Dunhuang manuscripts are Buddhist in nature, and both the Khitans and Uyghurs were mostly Buddhists, so there is a good chance that any Khitan-Uyghur manuscript would be a Buddhist text. ᠊ᠬ᠋ This looks as if it may be the same character as B.ii, although the top of the character is missing, so we can't be certain. The Uyghur gloss -q (Wang Ding gives an alternative possible reading of -in, but I think that can be discounted) has two prominent dots to the left, which are optionally used to distinguish the letter q from ɣ. If this character is indeed the same as B.ii then the trailing -q of this gloss fits perfectly with the leading qaču- of B.ii to form qačuq ᠬᠠᠴᠤᠬ᠋ which could plausibly be an alternate spelling for the Uyghur word qačuɣ ᠬᠠᠴᠤᠭ "sphere of perception or sense". ᠱᠢ‍ This character is unknown, but is probably a variant of (yet another uncommon Khitan character of unknown meaning). Cf. the variant pair of Khitan characters, and (both meaning "forty"), which show the same alternation of 土 and 丄 at the bottom. Its resemblence to the Chinese character xīn 辛 (the 8th celestial stem) may just be a coincidence, but on the other hand it is possible that the Khitan character is derived from the Chinese character 辛, and borrows its pronunciation, in which case the Uyghur gloss may be all that remains of šin. 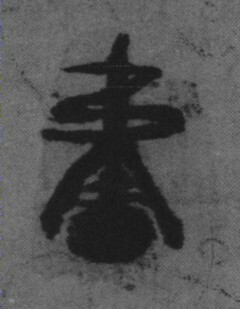 C.iv This character is unknown, although several very common Khitan characters are written with a "fire" top like this (e.g. and ), so it looks quite Khitan in form. Interestingly, it resembles the Chinese character guǐ 癸 (the 10th celestial stem), which seems almost too much of a coincidence given the preceding character resembles the 8th celestial stem. * The Uyghur transcriptions in italic type are based on the readings by P. Zieme in Wang Ding 2004. Note that the Old Uyghur text is hacked using Unicode Mongolian, so the glyph forms for some letters may not be exactly correct. Wang Ding, "Ch 3586: ein khitanisches Fragment mit uigurischen Glossen in der Berliner Turfansammlung"; in Turfan Revisited: The First Century of Research into the Arts and Cultures of the Silk Road (Desmond Durkin-Meisterernst, Simone-Christiane Raschmann, Jens Wilkens, Marianne Yaldiz, Peter Zieme eds.). Berlin: Dietrich Reimer Verlag, 2004. James Hamilton, Manuscrits ouïgours du IXᵉ-Xᵉ siècle de Touen-houang Volume 1. Paris: Peeters, 1986.